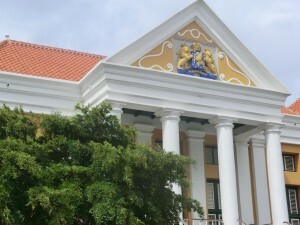 WILLEMSTAD - The second pre-trial review against the four suspects in the murder of politician Helmin Wiels will still take place in the Courthouse along the Wilhelmina Square. To our knowledge this session is only an extension of the previous review. The content of the case will be treated in May. There is still the possibility to hold the review in another location, such as the military barracks at Suffisant. The second trial hearing will take place next Wednesday at 09.30.